The goals scored by McDonald, Moult and Pearson delivered a win over Dundee in December to kick off a productive run that moved us up the table. It was the manager’s first home win in his second spell at the club and it also saw the debut of Ben Hall at centre back. Those goal scorers will have to be on form this weekend if Motherwell are to take three points at Dens. The home defence has been boosted by the January signing of O’Dea as a replacement for the long term injured McPake. Our opponents rarely fail to score. In their last four outings they enjoyed 2-1, 4-2 and 3-1 wins over Dundee United, Partick Thistle and Falkirk and lost to the only goal against Aberdeen. Hemmings has scored nine in the last six and he has in Stewart and Loy very able partners. There are a few vacant spaces in the Fir Park dressing room following the January departures of Taylor, Grimshaw, Twardzik, Robinson and Clarkson and it is expected that one or two will arrive before the transfer window closes. Whether any newcomer will appear in the starting line up remains to be seen but we will be close to the eleven who faced Ross County last week. Cadden will hope that his claim to develop a partnership with Lasley and Pearson continues and Kennedy was an able stand in for the injured Law at right back. Reports suggest that Law is fit and that Hammell, who had to be substituted last Saturday, is also available. 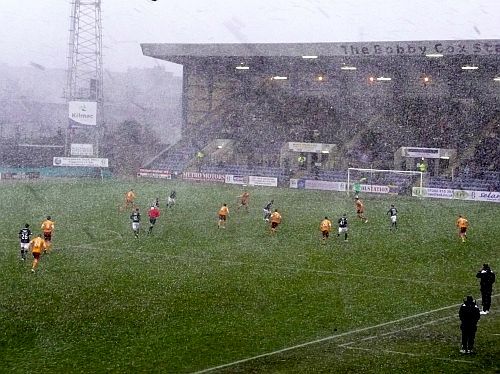 The pitch at Dens is likely to be heavy at best on a cold windy winter afternoon. Silky soccer is unlikely and after a hard fought match we will probably be pleased to take a point after a 2-2 draw.